Ebor Falls are located on the Guy Fawkes River near Ebor and about 37 kilometres north-east of Wollomombi on Waterfall Way in the New Englandregion of New South Wales, Australia. The first lookout is on a sealed road, approximately 200 metres off the Waterfall Way. This viewing platform shows the upper falls tumbling 115 metres over columned basalt rock in two falls. The lower Ebor falls, 600 metres further on, fall into a steep forested gorge below. The falls were first protected in a recreation reserve in 1895. In September 2008 new lookout platforms were opened. These replaced platforms that were destroyed by fire in 2007. The falls are a well known tourist attraction within Guy Fawkes River National Park, with viewing platforms of the falls and walking tracks, a rest area with barbecues, an information display, picnic tables and toilet. In 2008 the waterfalls were attracting up to 80,000 visitors each year. 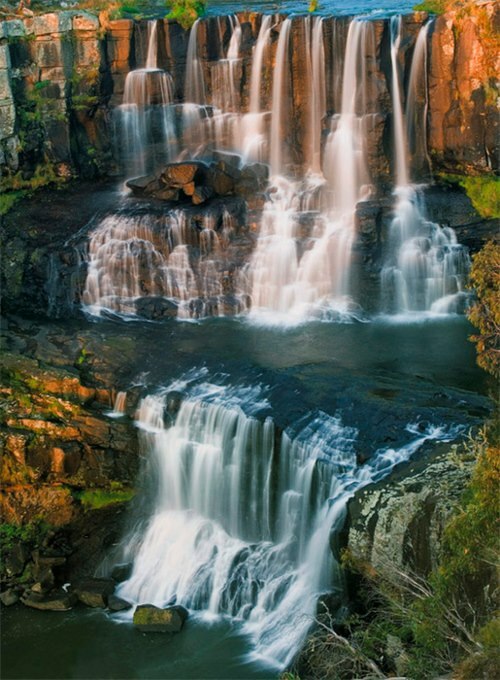 Camping is not permitted at Ebor Falls, however camping is available at nearby Cathedral Rock National Park.